Well Ace officially attended his first show today! We went to the Barn Hunt Trials that my Kennel Club held, and figured we would go just to work on his ability to be in crowds and around other dogs in preparation for his CGC Test Tuesday. (I’m so ready to give it a shot but not totally sure he’s going to pass, still has a few quirks we are working on but he’s come SO far in 7 weeks). We entered Instinct, and the Novice class, and I had zero idea of what to expect, except for watching a few YouTube videos before hand. Many people were kind and offering us advice, but Ace is a bird of his own feather. You never know what he is going to surprise you with. The one, simplest rule in Barn Hunt is do NOT let the dog eliminate in the ring during the class. Sounds simple right? We went in Instinct and Ace got to experience the rat’s smell, and right as I was about to call the rat, he pees right beside them. Found out that is the quickest way to get DQed on the spot. Lmao. Little embarrassed, but it’s not totally his fault. We were outside working in a ring covered in straw and hay bales. He’s never not been allowed to pee somewhere outside, and he really was just marking (which is rare for him). So we moved on to the Novice class, and gave it a shot. You have to find 1 rat, go in the tunnel, and climb on the hay bales to qualify. Ace immediately got up on a hay bale no issue, but I got too distracted trying to coax him into this tiny tunnel fit for a corgi. He was trying to hunt, and I forgot just how little time you have. We ran out of time, but as soon as they showed him where the rat was, he got very interested and started pawing at it. I like to think he had fun!! I definitely recommend attending a barn hunt trial! It was a great experience, and although I meant some very opinionated, “all knowing” people, I also meant some great, helpful people and got to try something new. This whole world is new to me, so it’s fun to start exploring! I can add RATI and RATN to our list of goals now(along with CGC, BN, RN, and TKN). I suggest, before entering in anything else, read the rules. I had read the rules before entering. I was told before walking in the class that he couldn't eliminate. I never figured he would since I had had him use the bathroom multiple times before walking in, and its not his usual style. He went from sniffing the rats, to an instant squat marking something before I could even react. I corrected him as quickly as I physically could, but he was already DQ'd. He was not the first dog to eliminate in the ring this weekend. Probably not the last, either. Beginners are going to make mistakes, it happens. Its people who are understanding and helpful, not critical, that keep them coming back to learn more. You can do everything possible and it still happens. The last novice scentwork exterior trial I was at at least half of the dogs eliminated in the search area. If one does it, it starts a chain reaction. My suggestion is to get your entries in early so you're more likely to be in the front of the run group and there's less temptation for him to mark. Yeah I was the last entry because I was a Day of entry, so I think that had something to do with it. I think someone had let their dog in their before hand, and it had peed. Half the people were sympathetic and laughing, the other half were borderline offended, lol. He had peed like 6 times before entering, so I really didn't think he had anything left. Many beginners the day before had been DQ'ed for having their cellphones in the ring, touching the dogs, or touching the hay bales. The judge was super excited because she was like "Mom, it wasn't your fault atleast! You did great!" Lol. In my opinion - This was a last minute deal - I have found that last minute deals are a bad idea - Ace was not prepared to attempt the barn hunt - which it sets him up or both of you to fail - I learned many moons ago that preparation is the key to success no matter what you do - Dog trails - racing - even work - With Mr. Business in his last OB training - he was getting all jacked up from the other dogs - As Greenie bought out - go In early if possible - And that's what I learned - He was on his game early on - the night of the ( show us what you got ) We were asked , who wanted to go first - We hopped up and did our deal - Mr. B did great - we set the bar and that puts the pressure on the others to do good . Best of luck to you two ! ECIN, we certainly weren't prepared, but also had zero expectations of any success. I wasn't told about the show until just three days prior. Among being swamped with other life situations, I did try to youtube some videos and read the rules of a Barn Hunt. My trainer was the one who encouraged me to attend, and enter the classes. We initially went for the sole purpose of getting Ace acclimated to being around other dogs and people, while behaving, because that has been a sticking point for our CGC Training. This was one of the few opportunities I had to get that specific type of training before our CGC test. Both of the trainers at my kennel club encouraged me to enter the classes once there, even with no experience. Most of the people in attendance were warm and welcoming also, and understand that we had zero knowledge before hand. It was all done in fun and good spirits, and no one was offended I was there trying something new. I felt like we had a successful day regardless of being DQ'd because Ace got to try something new and fun. Sure there were a couple sour grapes, lol, but all in all most understood that it takes beginners attending to keep a sport alive through generations. Not only that, but it was a great success in training Ace for his CGC. He had multiple dogs walk within close proximity of him, and for the first time ever, he wasn't lunging at them to play. He heeled nicely, and met a large amount of friendly strangers who were able to pet him on his head without him jumping all over them. I was able to walk him on a loose lead, which is really a big success for us in these past few weeks, and he even let (very respectful) children (who asked me first to pet him)pet all over him. I was able to talk to people with other dogs nearby without him acting up, and in all, he was extremely well behaved. So I feel like this helped us set ourselves up to succeed on the test that actually matters to me this week. you keep at it, as you seem to be doing, you will 'Ace' it. When I first started in dogs, I was so enthusiastic and loved all the venues, but seem to make every mistake in the book at first. Embarrassing if I were to relate them all, ha. Stay with it, learn it all, and enjoy the ride. I don't think it was a bad idea to enter at all...barn hunt instinct is just that - instinct. She read the rules, entered, and gave it a shot! Boys are boys, and barn hunt is the type of environment that can be VERY tempting to pee in! I've seen dogs (boys AND girls) pee in a barn hunt and scent work environment on more than one occasion, that's for sure! Richter's peed in a Nosework practice, and so has Sypha (fingers crossed, never in a trial, but it sure could happen!). You do your best to see it coming and stop it, but...dogs are also dogs. Sometimes there isn't a darn thing you can do to stop it. If you liked the sport and think it's something you want to pursue, look for some classes or practices and let them know that he did pee in the ring so it's something you want to work on. Just my two cents...I wouldn't find it that concerning, and if you had fun and want to pursue the sport I say go for it! 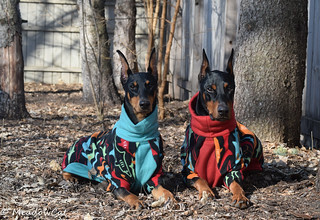 dobebug and danacc like this. In falnfenix's defense you didn't say that you'd read the rules. Tracking* is pretty much the only sport that I can think of where eliminating during a run isn't an automatic and immediate NQ. Just be glad they didn't make you pay for the bale he peed on. *I'm guessing maybe in field trials it's okay? Be kind of hard to stop a Pointer who is nearly 100 yards away from their handler from lifting a leg or squatting. Thank you guys! It was a great experience, and I don't regret going whatsoever. I learned valuable information, and got to expose Ace and myself both to the "show" atmosphere. It's not as relaxed and laid back as I expected for this type of event, but it was enjoyable still! The local kennel club offers many opportunities to practice, and only throws a few shows a year for it, so we have plenty of time to practice before the next one. We will give RATI a shot next time! Luckily I have unlimited straw bales at my disposal, so I can practice at home somewhat. Sorry, even after reading the rules, I still didn't know what to expect once I entered the ring. I knew what was expected of us, but how it was going to go for us was something I wasn't able to predict. Poor choice of words, I assume. I had no idea whether Ace would pick it up or not, and had zero idea what to expect from the atmosphere of the show. I've been to horse shows time and time again, and this was a completely different type of atmosphere than that. Plus, I was quite curious to see how Ace would react to smelling a rat. As for peeing, I hadn't even considered the fact that Ace would do that. I thought my boy would know better, but lesson learned. He's still just a learning puppy himself though. There was a couple people who mentioned "Don't let him pee on anything because everyone will hate you" and that was a bit intimidating, especially since they came over and asked why I let him do that after, lol. Like many have said there and here, no real way to know he was going to do that, and by the time he squatted and I reacted, it was too late. It happens. Not to start anything, but I somewhat agree with what a fellow lady at the show said. "Its not your fault the dog peed. These dogs are meant to be able to sniff out a rat on a course. If they get that hung up on another dog's pee, then you haven't trained them as well as you thought you have." Granted, I certainly see both sides of the debate there. I posted this story to share our experience as beginners, and I thought it was rather funny. Also to encourage any other beginners to go out and try new things! A community that is welcoming to beginners is one that thrives. I've been very lucky to work with a couple trainers who are constantly helping and encouraging me. They often want me to try new things, and show me the path to succeed. The two trainers and I have been working hard for 7 weeks in preparation for this CGC test, and fine tuning my amazing pup into a well behaved young man, and we all three thought it would be a good place to let Ace have fun and a small reward for all he has accomplished. Last edited by Chesa; 10-29-2018 at 02:40 PM. Eh, we were doing a heeling pattern in novice when instead of sitting on the final halt, Ilka squatted and proceeded to make a huge puddle. In an indoor ring. After I have no idea how many potty breaks outside. This from the dog who hadn't once peed in the house or any other building. And it was far from her first time in the ring. Whenever we get the chance to do barn hunt, I'm going to be watching Miss Marks-A-Lot, aka Leo, like a hawk, because I can fully believe that she would try it. I can't tell you how many times I have read and reread the NACSW rules and my mind went blank at the first ORT test. Even with a prior run over for those taking the test especially for the first time. Oh my goodness!!! That is just too funny! It weird. You walk in the ring not even considering your dog to act like that, and boom,..... you are staring at your dog like "What the H*** dude?!" in total disbelief. Lmao. She had to go, I guess! It makes me feel a lot better also, I know you guys put a lot of hard work and practice into your shows, so its relieving to know people at all levels have these type of things come up!